Yayoi Kusama recently created three immersive mirror rooms for the Victoria Miro Gallery. 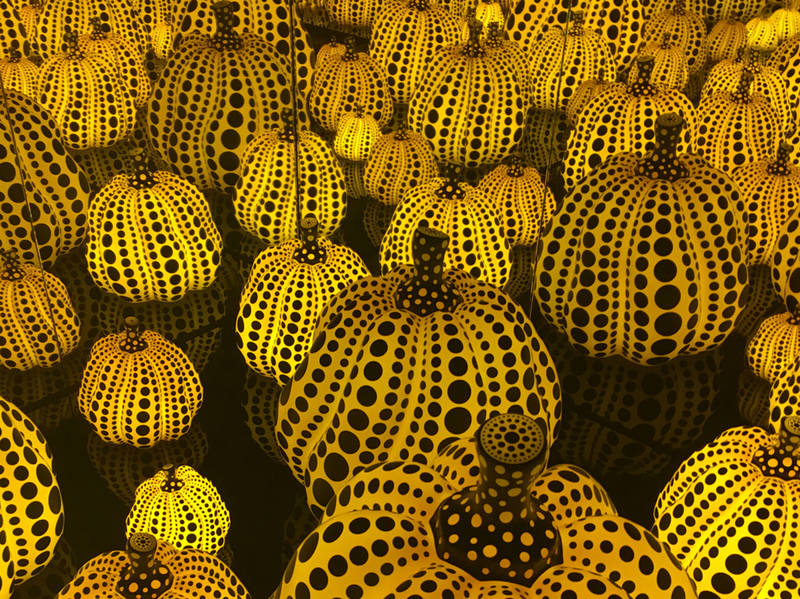 The exhibtion gives a wealth of inspiration for visual displays through a range of sculptures, paintings and installations that were all made by Kusama specifically for the exhibition within the last year and featured plenty of her iconic pumpkins! Kusama’s infamous polka-dot patterns have purveyed into different areas of design, including fashion – in the past Kusama has created collections for Louis Vuitton which also included a concept store for the brand at Selfridges, as well as t-shirts for Uniqlo. Our favourite room was the pumpkin filled installation titled All the Eternal Love I have for Pumpkins. The room was incredibly immersive, with the entire space covered with mirros and filled with yellow and black pumpkins so that the installation appeared to stretch on into infinity. Touching on the obsessive, Kusama’s repetitve use of patterns and shapes stem from past psychiatric hallucinations. Leading to All the Eternal Love I have for Pumpkins are three bronze pumpkin sculptures with black circles. 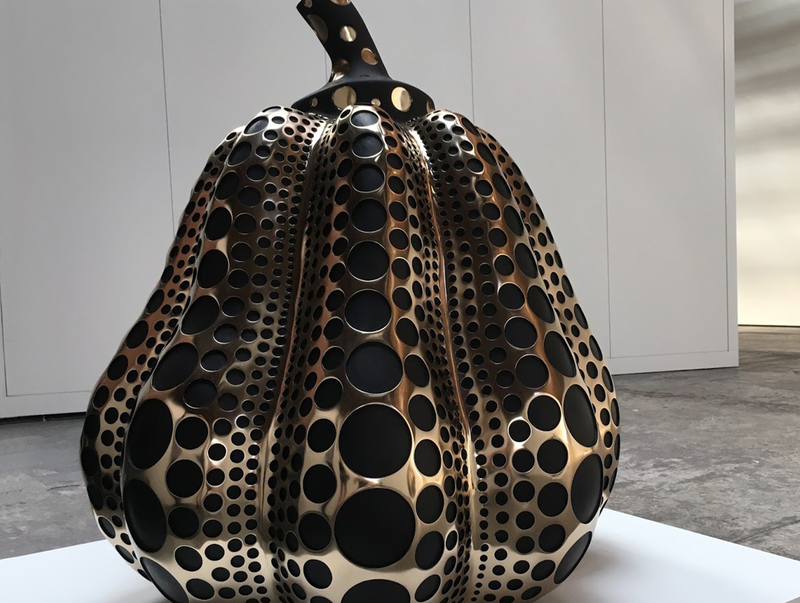 Kusama finds solace in pumpkins – a motif she has returned to throughout her career – as they have provided her with a source of inspiration and comfort since childhood. Downstairs was another exploration of Kusama’s Mirror Infinity Rooms, this time a darker installation titled The Chandelier of Grief. 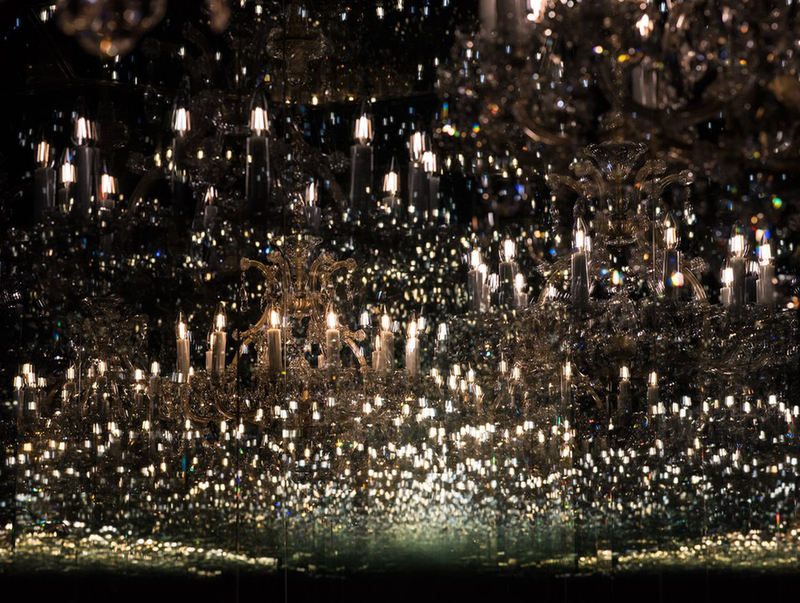 It features a rotating, gothic chandelier which dramatically casts reflections when hit by bursts of light.